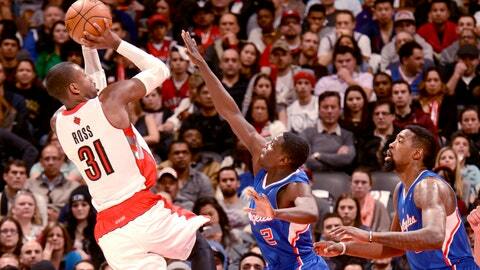 Terrence Ross of the Raptors scored 51 against the Los Angeles Clippers on Saturday. So first Kevin Durant set a career high with 54 points Jan. 17 against the Warriors. Then Carmelo Anthony set all kinds of records by dropping 62 in the Garden on Friday night against the Bobcats. And when Terrence Ross followed with a 51-point game Saturday against the Clippers, the NBA’s high-scoring outburst officially was out of control. That guy on the Raptors that you probably haven’t heard of — unless you love sick dunks, that is. You remember when he took home the Sprite Dunk Contest honors last year? But 51 points against the Clippers though? Granted their defense isn’t amazing this season (ranked 13th in points allowed), but what was in Ross’ energy drink on Saturday? ”You don’t really realize what you’re doing until it’s all over,” said Ross, who’s averaging 7.8 points in his career. Ross matched Vince Carter’s franchise record set 14 years ago and nearly doubled his previous career high of 26 points against Portland on Jan. 2, 2013. The second-year guard connected on 16 of 29 field goal attempts, made 10 of 17 from 3-point range and went 9 for 10 at the free throw line. But he missed his final foul shot with 4 seconds left, failing to top the 51 points Carter scored in a 103-102 win over Phoenix on Feb. 27, 2000. Oh, and the Raptors lost, 126-118. The Clippers’ Jamal Crawford went up to Ross at the end of the game and gave a message of congratulations and consolation to his former workout partner. ”I told him, ‘Welcome to the 50-point club,”’ said Crawford, who set his career high with 52 against Miami in January 2007 and had a season-high 37 Saturday. Ross isn’t the first and won’t be the last to come out of nowhere and hit the half-century mark. Does anybody recall Tony Delk’s 53-point game for Phoenix in 2001? He did his thing in college with Kentucky and was part of the ’96 championship team, but was short of amazing once he got into the NBA with a career average of 9.0 points. So when he scored 50 off a 20-for-27 night against the Kings, there was plenty of head-scratching. The announcers were in shock once he got into double digits. Phoenix must’ve had something in the water in the early 2000s because Clifford Robinson also had a 50-point game for the Suns, a year before Delk did. While Robinson had a better career than Delk, getting Sixth Man of the Year honors in ’93 and making the All-Star cut once in ’94, the 50-point game against Denver was no doubt unexpected as he averaged just 14.2 points in his career and was the oldest to record his first 50-pointer at 33. How about Damon Stoudamire, a career 13.4-point scorer who never was an All-Star, scoring 54 for the Blazers on Jan. 14, 2005 against New Orleans? Or Vernon Maxwell, a 12.8-point scorer and never an All-Star, scoring 51 for the Rockets on Jan. 26, 1991 against Cleveland? Or Willie Burton, who averaged 10.3 points in eight NBA seasons, scoring 53 for the 76ers on Dec. 13, 1993 against Miami? Don’t forget Tracy Murray, who averaged 9.0 points in his career but hit 50 for the Wizards on Feb. 10, 1998 against Golden State. Or Dana Barros, who averaged 10.5 but dropped 50 for the 76ers on March 14, 1995 against Houston. Or Walt Wesley, who averaged 8.5 but had 50 for the Cavs on Feb. 19, 1971 against Cincinnati. It’s always fun to watch guys explode for a ridiculous amount of points, especially if they’re not household names. High scoring has been contagious lately so maybe even the No. 1 draft pick, Anthony Bennett, might drop … OK forget it.